Underfloor Heating Cable Mats can be installed on top of either suspended floors or solid concrete floors enabling installation in all types of rooms. Ceramic, Natural Stone, Slate, Quarrystone, Porcelain, Marble, Limestone & Terrocotta. 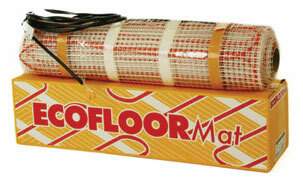 Ecofloor Underfloor Heating Mats are a combination of self-adhesive mesh with a heating cable pre-attached. The mat design enables fast installation and an even heat distribution across the whole floor. Ecofloor Underfloor Heating Mats are 500mm wide and available in a range of lengths. Ecofloor Underfloor Heating Mats have a twin conductor cable simplifying installation with a single 3mm "cold tail" connection. The finished installation is controlled using an easy to use programmable thermostat. Ecofloor Underfloor Heating Mats are available in 160W/m2 or 200W/m2 heat outputs. The 160W/m2 mat is suitable for internal applications including kitchens, bathrooms and living areas. The 200W/m2 mat is recommended for conservatories or areas prone to high heat losses. Ecofloor comes with a 10 year guarantee against manufacturing defects. Ecofloor Underfloor Heating Mats are very simple to install by following the comprehensive instruction booklet included with each cable mat. Rooms requiring more than two mats require connection to the thermostat via a standard junction box. When fitting Ecofloor to a timber sub-floor it is essential that you take the standard precautions to stabilise the floor and prevent floor movement. You must always over-board the timber floorboards or chipboard with a surface suitable for tiling. Devine heat recommend Ecomax Insulated Tile Backer Board or primed 18mm WBP Plywood. 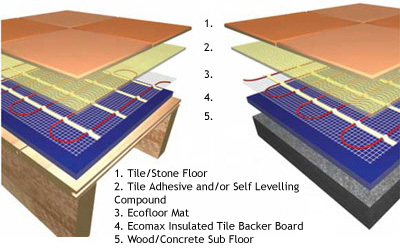 For best performance it is recommended before fitting Ecofloor you fit a layer of Ecomax Insulated Tile Backer Board. This will minimise heat losses & ensure quicker heatup times for the floor. Ecofloor can be laid directly onto an un-insulated floor However this will slow heatup times, increase running costs & is not recommended.